The series of acts passed by Parliament during the 1760s and 1770s is what initially sparked the unrest that led to the American Revolution. The acts regulated trade and commerce in the colonies and were passed to help pay off the debt that the British government had incurred during the French and Indian War. The colonies resented the acts and felt they were a blatant attempt to make money off the colonies. Since the colonists were unable to vote on the Parliamentary officials who passed the acts, they felt they were being taxed unfairly, hence the colonist’s motto: No taxation without representation! The Sugar Act was passed by Parliament in April of 1764. The act placed a tax on sugar and molasses imported into the colonies. This affected Boston and New England greatly because the colonists there used sugar and molasses to make rum. The act was also intended to stop trade between the colonies and the Dutch, French and Spanish. Boston merchants responded to the act by boycotting British luxury imports and vowed to find ways to increase colonial manufacturing to make them less dependent on British goods. The Currency Act consisted of several acts, such as the Currency Act of 1751 and the Currency Act of 1764, that regulated paper money issued by the American colonies. The acts were passed to protect British merchants from being paid in depreciated colonial currency. The acts forbade the colonies from issuing paper money, which was creating problems due to inflation and a complex system of varying values and types of money from the various North American colonies. The Currency act created tension in the colonies because it was seen as an attempt by the British government to gain control of the colonies monetary policies. The Stamp Act was passed in March of 1765. The act was a tax on all paper used for printed materials in the colonies. It required that all materials printed in the colonies be printed on paper embossed with an official revenue stamp. The printed materials in question included everything from newspapers, to magazines to legal documents. 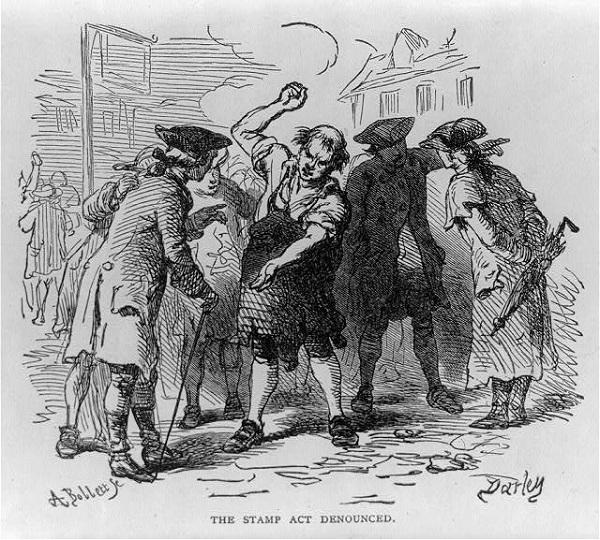 The Stamp Act was the first new tax that the colonists actually took to the streets and held public protests about. A new political group, the Sons of Liberty, formed in Boston as a protest against the act. The group held public protests around Boston and incited a number of violent riots during which tax collectors where tarred and feathered and many government official’s homes were looted and burned. The Townshend Acts were passed in 1767. The acts consisted of the Revenue Act of 1767 (which placed a tax on British goods imported into the colonies such as glass, tea, lead, paints and paper), the Commissioners of Customs Act, the Vice Admiralty Act, and the New York Restraining Act. The acts were highly unpopular and met with resistance from the colonists, especially in Boston. This prompted the British government to send more troops to Boston, in 1768, to help enforce the new taxes. A new political group, the Daughters of Liberty, formed as a result of the Townshend Acts and organized boycotts against British goods. In 1770, the Townshend acts were repealed except for the tax on tea. The Tea Act was passed in 1773. It allowed for tea to be shipped by British companies duty-free to the colonies, thus allowing them to sell the tea for a discounted price. The tea act was intended to be a bailout for the British East India Company which was suffering financially when colonists began boycotting British tea. It was also intended to subtly persuade the colonists to comply with the tea tax by offering them the tea at a cheaper price. The colonists greatly opposed the tea act because it gave British companies a monopoly on the tea trade and it helped promote the tea tax. The tea act prompted the Boston Tea Party in December of 1773. This was a protest against the tea act during which several hundred colonists boarded merchant ships in Boston harbor and destroyed millions of dollars of British tea by throwing it overboard. The Coercive Acts were the British government’s response to the Boston Tea Party. 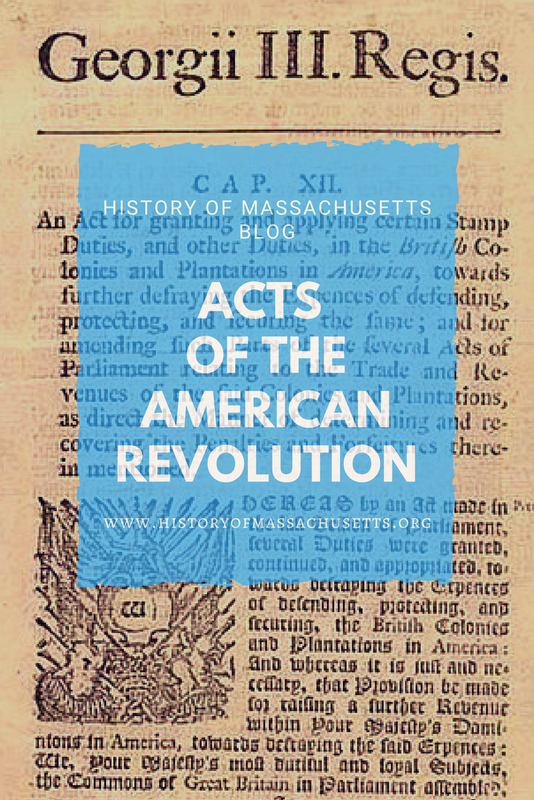 The acts were passed in 1774 and were a series of four acts designed to restore order in Massachusetts and punish Boston for its rebellious act. Boston Port Act: The Boston Port Act closed Boston harbor until the damages from the Boston Tea Party were paid for. Massachusetts Government Act: Massachusetts Government Act restricted town meetings and made it so positions on the Governor’s council were appointed by the British government. Administration of Justice Act: Administration of Justice Act made British officials immune to criminal prosecution in Massachusetts. Quebec Act: Quebec Act gave freedom of worship to Catholics in Canada. The acts were intended to suppress rebellion in Massachusetts and isolate it from the other colonies. Instead, the other colonies came to Massachusetts’ defense and formed the First Continental Congress to discuss forming a united resistance against British rule in the colonies. Very helpful; in my class we are writing an american revolution book, and this was very helpful!! Thanks,Very helpful during a report. This helped me a lot when I was working on a study guide for my up coming unit test in humanities, Thank you! Very good! I feel slightly more prepared for my midterm now!